Google Search Console is one of the unsung heroes of the Google technology stack. It doesn’t inhale marketing spend like AdWords does. It’s not as universally used as Google Analytics. It isn’t as revered by agencies as DoubleClick. Yet, Google Search Console (or GSC) provides foundational insights about website structure that no digital marketer can ignore. A recent update by Google brings enhanced information from GSC to the Google Analytics reports you already know and love. 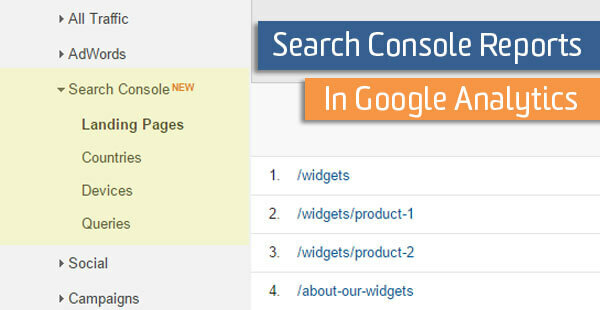 First, make sure that Google Search Console is connected to your Analytics account. Follow our instructions here. I’ll wait. (not provided) is a way of life at this point. We’re not going back to full keyword data by landing page. So what do we do? Well, we used to export everything possible from GSC every 90 days (Metrics like Clicks, Position, etc), then mush it into Google Analytics export data of page efficacy (bounce rate, goal completions, conversion rate). No more! Now you can simply pull up the Acquisition > Search Console > Landing Pages report to find that data, and it’s ready to analyze! You can see CTR for your organic landing pages alongside goal & conversion actions. Does it align with your priorities? Do you see high-value content on this list? Unfortunately, this report won’t show you specific keywords driving page traffic. You’ll still have to connect those dots on your own. Acquisition > Search Console > Queries report introduces Organic query CTR to Google Analytics. How does this data pair up with AdWords paid keyword data? That’s a very interesting thing to measure over the long haul. Are branded terms receiving higher positions and CTR? That’s pretty normal. If not, it could indicate something is wrong with Google’s ability to access key pages. As a note, there’s a pesky (other) row in these reports that can cause some confusion. In short, it’s not actually hiding anything that you would see otherwise and it’s not something you can change. We’ve got a whole post about this, so head over there to learn more about the Search Console (Other) row. Formerly there was no organic search impression by device metrics in Google Analytics. Sure, you could see device trends from your traffic in Behavior reports, but that only accounted for behavior once a visitor made it to your site. The new Acquisition > Search Console > Device Category report provides impressions and CTR by device from the actual organic search page. How does Desktop CTR compare to mobile? This could influence any number of things from the type of content you write to bid adjustments you make in paid search campaigns. The too can be said for the new country report. Acquisition > Search Console > Country provides some data that can’t be found in either Analytics of GSC alone. This report applies impressions and CTR to your traffic’s country behavior. See a nation that really stands out? Maybe it’s time to author region-specific content or create a new AdWords campaign just to target that country. Ok, so it’s not life-changing, but it’s interesting to look at every now and then. These GA reports blend the data found between two of my most relied on tools. These updated Google Analytics reports in no way give us back the data we lost in the (not provided) fiasco. Though, they will be tremendous time savers.